Hired as patrolman in April 1981. Promoted to Corporal in 1985 and served as Sergeant from 1997 to 1999. Walt was promoted to Chief of Police in 1999 and served in that capacity until December 2011. Hired and served as patrolman in 1982. Promoted to Corporal in 1988 and served as Sergeant fom 1999 until retirement in 2005. Hired in 1984 and served as patrolman. Emergency Response Team member and Less Lethal Projectile instructor. Served the department in fingerprint analysis examination. Retired in 2001 after a severe on-duty injury of three cracked vertebrae in his neck during a domestic assault arrest. Hired in 1966 and served as patrolman until 1972 when assigned as a criminal investgator. Ron performed those duties until promoted to Chief of Police in 1981. 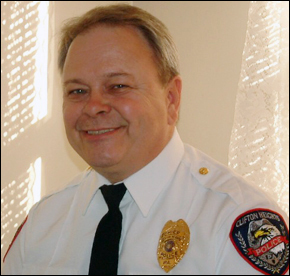 Ron served as Chief of Police until 1999. Hired as patrolman in September of 1953. Promoted to Sergeant on February 2, 1967 and served as Sergeant until his retirement on February 5, 1984. Hired by Borough of Clifton Heights Police Department in 1948. Promoted to Chief of Police in 1958 and Retired as Chief of Police on April 3, 1981.